This is another one I read repeatedly as a child; I could recite it to you from memory. It is so typically Dahl - disgusting antics, laugh out loud scenes, captivating prose, and sheer imagination. It is slightly darker than Dahl's other works, and some may say for a children's book it's disturbing in places. The tricks the Twits play on one another are hilarious. They are so foul and repulsive that you can't help but hope they will get their comeuppance. 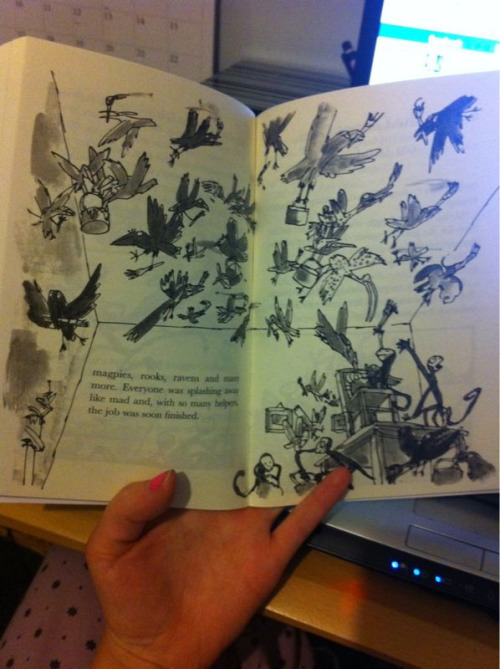 But this is a Dahl novel, and of course karma catches up with them in the form of the good guys – some monkeys and birds! Dahl's moral message in this one is that no matter how you look on the outside, if you maintain happy, kind thoughts, then these will shine out of your face and make you look lovely. Unfortunately, the opposite also applies, and we are shown this in the form of Mr and Mrs Twit. So be happy and be gorgeous, think nicely of people and you will be a beautiful person. I don’t think there are many messages better than this. I don't think I've mentioned much of Quentin Blake in my Dahl reviews, but his illustrations are what make Roald Dahl books so wonderful for me. He really helps to characterise Mr and Mrs Twit with his drawings; they are so impressive and add a lot to Dahl's stories. Click here to see my favourite illustration from The Twits. I found this one breathtaking. This is such a lively book, and it's a great one for kids because it's so funny. It's definitely worth a read, and it's only short so it's a nice way to pass half an hour. 14 / 72 books. 19% done!